Three black or Asian children are vying for adoption into every home that has adopters of a similar background, a charity says. Jean Smith, from the NCH children's charity, told BBC Asian Network more ethnic minority adopters were needed. She said placing children from ethnic minorities with white parents often left them without a sense of cultural and religious identity later in life. black, Asian or of mixed heritage. In the 1970s, many ethnic minority children were adopted into white families, but today the care system tries to make cultural and racial matches. However, because of the shortage of prospective parents from non-white communities, black and Asian children can wait a long time to be placed. The Asian Network examined the issue in a special report called "Why Are We Waiting? ", part of the BBC's Family Wanted series. Nick Pendry, whose birth parents were both Indian, was adopted by white parents in south west London in the 1970s. He said so-called "transracial placements" were far from ideal. "My cultural and racial sense of self was missing and that can't be made up later in life," Mr Pendry said. "I had a period of time when I wanted to be white and every time I looked in the mirror it was a bit of a shock to me that I wasn't. "There's something inherently unfair that white children in care have the option of having a cultural match more times than black and Asian children." David Holmes, from the British Association for Adoption and Fostering, said the policy of trying to match Asian children with Asian parents was about trying to "reinforce the child's background and ethnicity". "We think that's one of the factors that can really help a child to settle in a new home," Mr Holmes said. Ms Smith said that, historically, Asian families or even neighbours would look after each other's children, but rarely seek formal adoption. One reason for that was the cultural stigma surrounding adoption, she added. "Quite often it says something about people's infertility. It's making a public statement about their ability to have children." She also said many problems could arise from transracial adoptions, not least from the basic matter of looking different from one's parents. The Prophet Muhammad himself was fostered. He promoted fostering in his life time. "That child can never just blend in and choose to tell who they want to tell," Ms Smith said. One Asian child needing adoption is 20-month-old Neo. 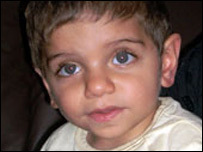 His birth mother was addicted to drugs and gave him up to be looked after by Bradford Children and Family Services. Neo has been in care since he was six weeks old. Ismail Aman is director of Foster Care Link, a service specialising in black, Asian and ethnic minority placements. He told the BBC that more Asian children were being put up for adoption because of social changes within their communities which lead to more family breakdown. Drugs and alcoholism were more prevalent now than in the past, he said, and problems like domestic violence and child abuse were increasingly dealt with publicly rather than within families. But Mr Aman said the history of adoption within Islam stretched back 1,400 years and should be actively encouraged. "The Prophet Muhammad himself was fostered. He promoted fostering in his life time."